I simply could not do justice to our recent trip in one blog post, so I am splitting it up and featuring them in our “Where We’ve Travelled” series. I will also intersperse with non-travel related blog posts for those who stop by for the financial and early retirement stuff. Enjoy! First stop on our adventure: Niagara Falls. Ready for our departing flight in Sydney! 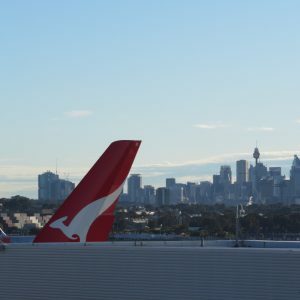 We departed from Sydney, via LAX and arrived at JFK Airport a little after four o’clock in the afternoon. Our connecting flight to Washington D.C was due to depart at about seven thirty. Unfortunately, Delta Airlines experienced significant delays and we didn’t take off until after midnight. We arrived at our friend’s house in D.C at around two a.m.
After a couple of hours of shut eye, we were in the car and headed off. It took approximately seven hours before we arrived at the American side of the Falls. It was incredible! We purchased Cave of the Winds tickets for $17 per adult or $14 for children. 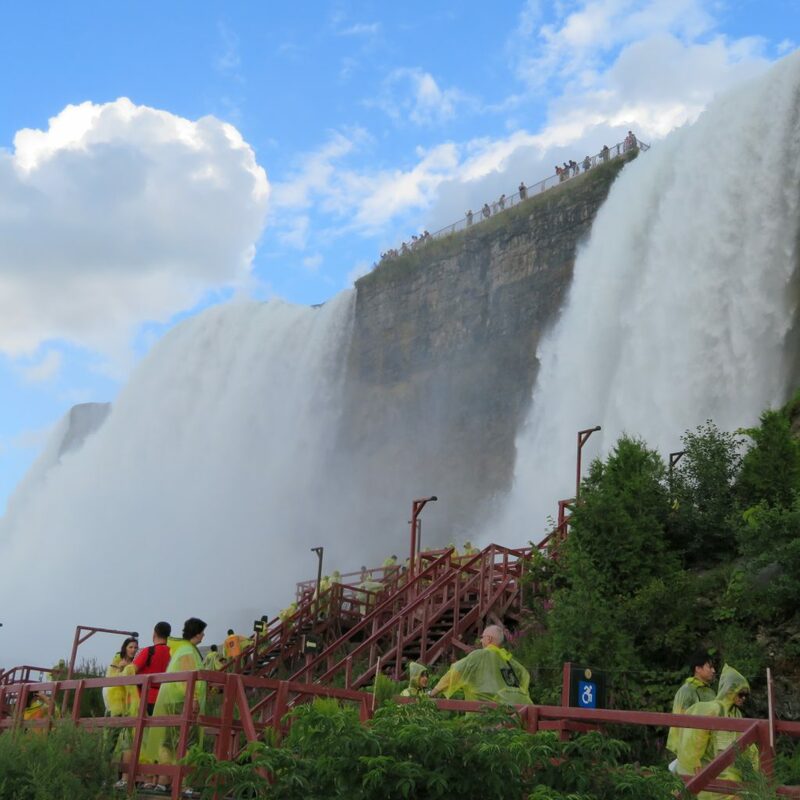 With a yellow raincoat on, you can walk down below the falls and get up quite close. Be careful, you do get a bit wet, but it’s worth it! After we dried off, we attempted to cross the border over to Canada. Unfortunately, it was Sunday night and apparently, that is the busiest time to make the crossing. Over two hours later, we finally made it into Canada. Crossing the border into Canada. The next day, we made our way up to a lovely little town called Niagara on the Lake. It was full of quaint little shops that the three girls browsed while the three boys did a tour of Fort George, a military fort on the outskirts of town. Adult entry is $11.70 and kids get in for just $5.80. That afternoon, we hit the Canadian side of the falls. We both agree that the Canadian side of the falls was much better. 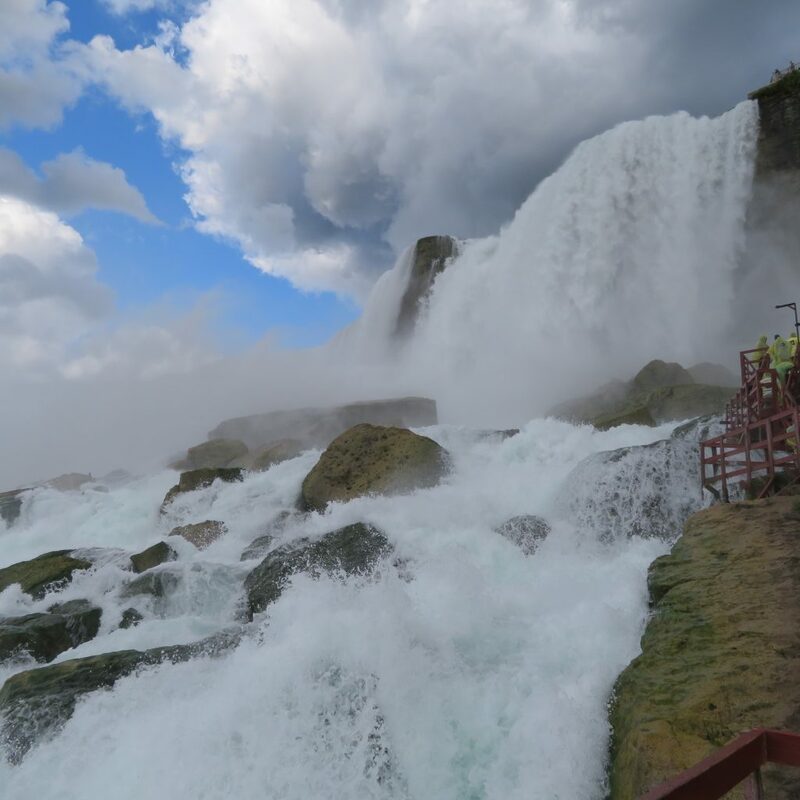 The sheer size and force of the falls is incredible. The Canadian side of the falls. Poopsie even managed to capture a rainbow. 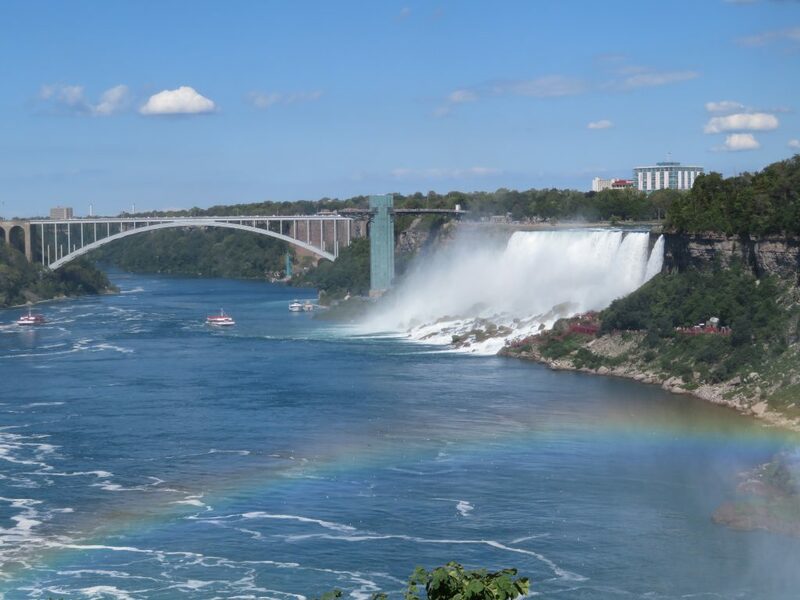 We did the Hornblower Niagara Cruise which was amazing. Below is a photo Poopsie took of one of the Hornblowers. Obviously it’s not the one we were one, but it gives a good context of how close you get to the falls. Tickets were $19.95 for adults and $12.25 for kids. It was well worth the money in our opinion. It was pretty cool. Our boat. Any closer and we feared for our camera. This photo does not do justice to how close we got. The mist of the falls is pretty heavy though, and we were worried about our camera getting saturated. Rest assured though, we got pretty close. Taken on our Journey Behind the Falls. We also did the Journey Behind the Falls. This takes you through some tunnels behind the falls and then out onto a viewing platform, which is where we took the above photo. Adults were $16.95, kids $11.00 (not including tax). To be honest, I don’t think it was worth the money. The American Falls, shot from Canada. Throughout our time at Niagara, we stayed in an AirBnB place. I am not linking it here as it wasn’t great. The friends we were travelling with had eleven year old twins. To pass the long hours in the car, they started a game of counting how many Tim Horton’s they saw. For those who don’t know, Tim Horton’s is a coffee and donut chain in Canada. Pretty soon, the adults were more interested in how many we saw than they were! Stay tuned, we will reveal how many we saw once all of our Canadian trip posts have been published. Leave your best guess in the comments (for those playing, we spent 6 days in Canada if that helps with guessing). This was from sighting number one! 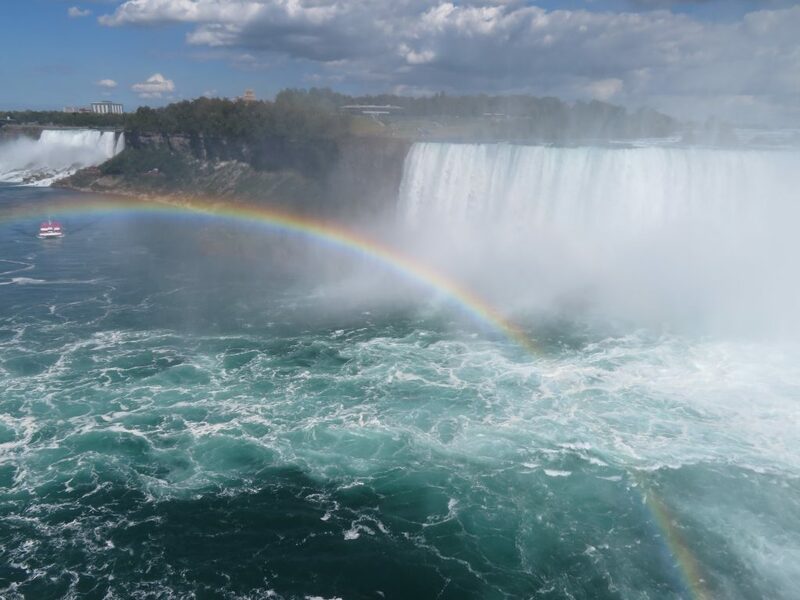 Have you been to Niagara Falls? What did you think of it? How many Tim Horton’s do you think we saw? I’ll guess you saw 60 Tim Hortons! 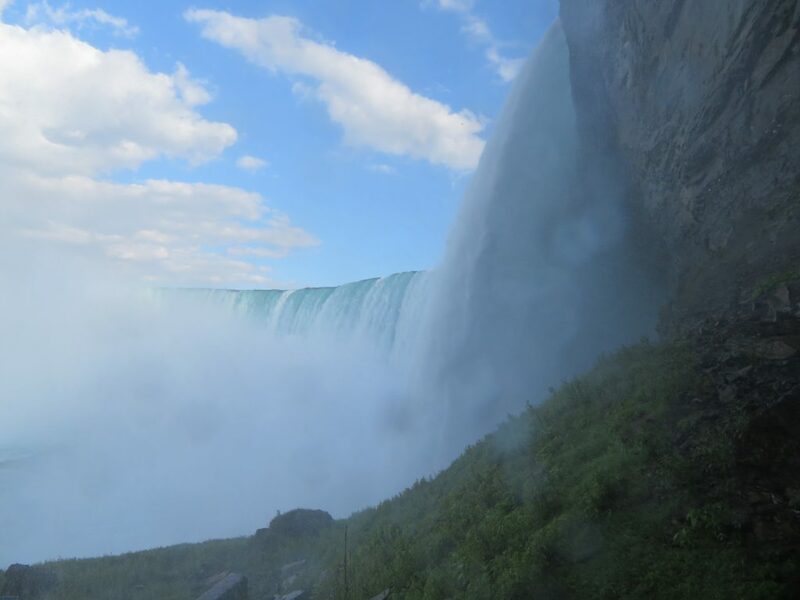 Those pictures are amazing and you’ve definitely made me want to see the Niagara Falls at somepoint in my life. Wow. I bet you had an amazing trip! The pictures are all unedited from the new camera we bought for the trip. A review on it is forthcoming. We’re very, very happy with it! Definitely get to Niagara Falls. I was a bit blasé about going, but I am so, so glad we did. It was fabulous! Thanks for this. Being geographically challenged, I had no idea that there were two sides to Niagra Falls! The only people I’ve ever heard speak of it said that it was a disappointment, and not worth visiting. After seeing your photographs, though, I would have to disagree. It looks fantastic. I have no idea about the Tim Hortons, but I will be more conservative than Tristan. I’ll guess 32. That’s 5 a day on average, plus a couple extra. I just visited their website through your link – did you see that they have a credit card?! 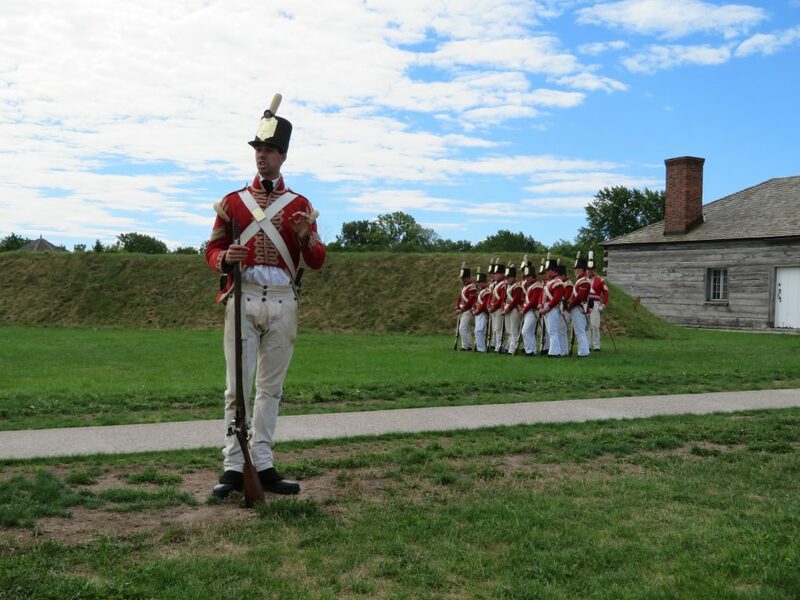 What a lovely recap of your visit! 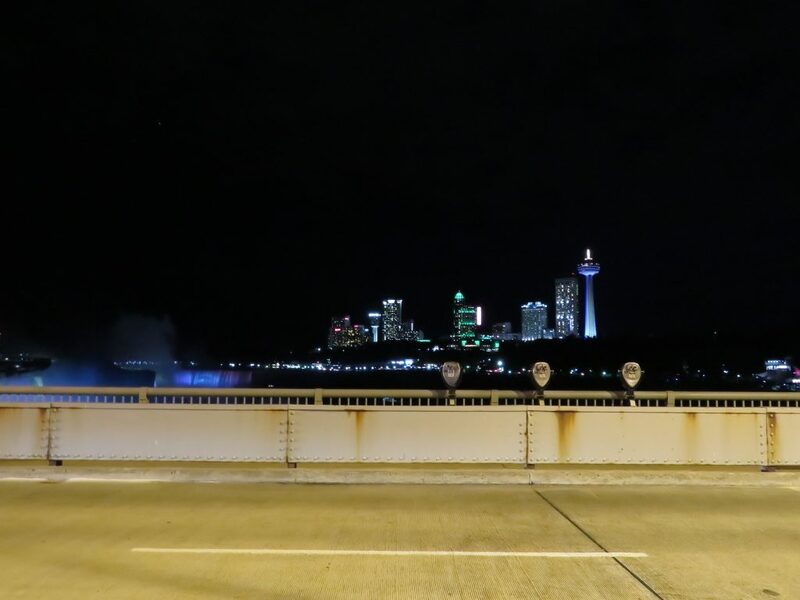 Living in Toronto, heading over to the Canadian side of the Falls is a popular day trip, and I love taking family visiting from abroad there when they come to town. 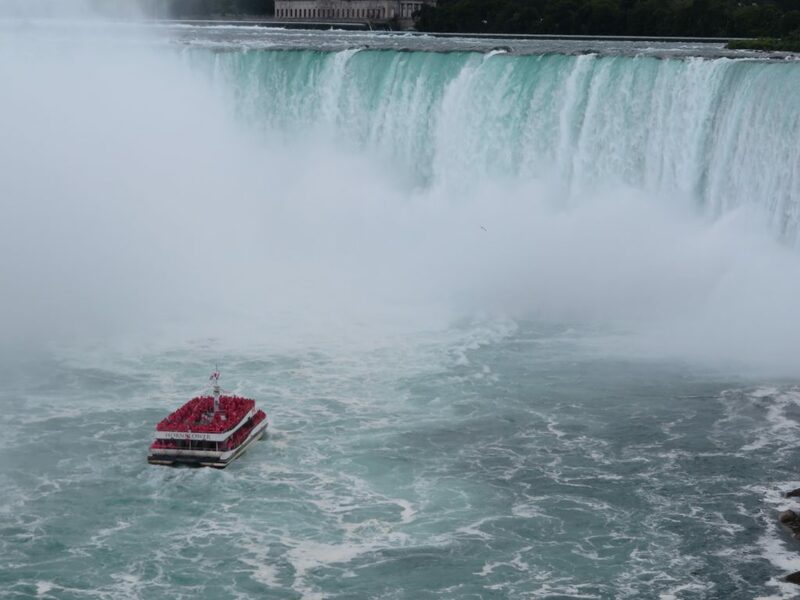 The boat rides into the Falls are so worth it (I went on the Maid of the Mist) – it’s amazing how magnanimous they are from down there! Glad you also got to indulge in some Timmy’s, which is how us Canucks affectionately refer to Tim Horton’s 🙂 You can’t throw a rock in any direction without hitting one around here! 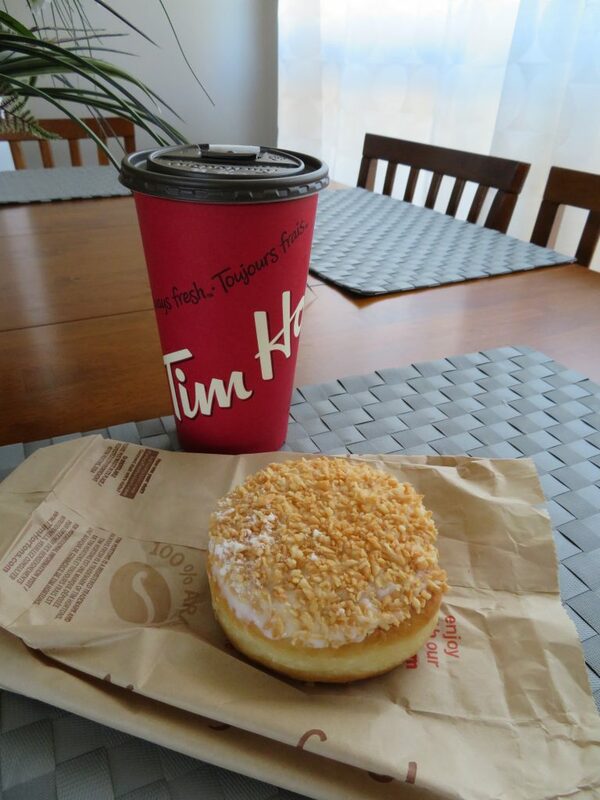 A “double double” and donut from Timmy’s is one of my favourite low-cost indulgences! Oh a Timmy’s fan! And you’re from Toronto! Stay tuned. Next week is our post on Toronto, I hope we do your great city justice! I was so excited to read this post. My wife and I want to visit Niagra Falls so badly. With a one year old we have been reluctant to fly and drive more than two hours with him. He normally gets fussy any longer than that. Did you encounter any busy kids on your tours and do you think it would be safe to bring young children? Hi! Thanks for the comment and question. We saw plenty of kids while we were there. Lots of strollers, lots being carried and plenty walking around on their own. I can’t specifically remember any very small children on the boat we took out, but as far as I know, there was no minimum age requirement, so I’m sure it will be fine. They might get a bit wet so if your one year old doesn’t like water, maybe skip that part. 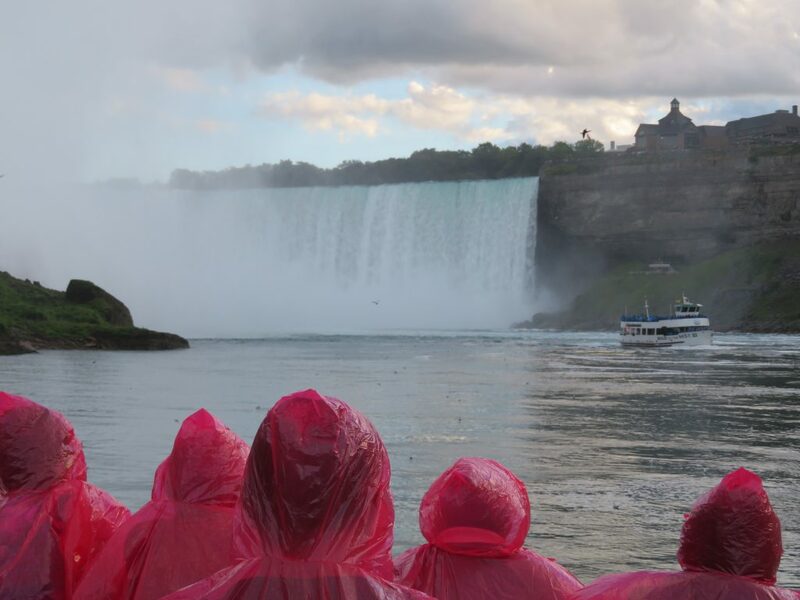 Even if you just went to see the Falls, it will still be amazing. All the other stuff we did was great, but seeing the Falls is what was truly memorable.